There is something we can do about it...say no to the dem party MSM and everyone that supports it. Every day they lose money, viewers, ad dollars...let's help them on their way to irrelevancy and bankrupcy!! Oi! No, Willard was not right about everything if only because he was in close agreement with Obama on a great many issues outside foreign policy. The pick on Putin was sound but no one has had the stones to call him what he clearly is: a blood-soaked tyrant. As for economic issues, Romneynomics are essentially Keynesian though his views of the regulatory state are modestly less draconian. Romney would already be in Syria, it seems impossible to say otherwise, and we would be six or eight months further along in that story arc, certainly with Boots on the Ground (as trainers or 'security' at a minimum) and with the local islamists and mafiosi purveying their bitter wares. Something the Founders understood has been lost to nearly every murmuring voice in the hive. As Mencken put it, man goes not from error to rectitude. He goes from error to error. There is NO ONE 'qualified', morally or technically to be President of the United States. There is no one obviously qualified to be the mayor of the smallest burg. But we seem to need someone. There are never perfect answers to the most trivial problems of governance. There are rarely good answers. What always exists are WORSE answers and a WORST answer is always in a darkened orbit waiting to intrude. Avoiding these is the only proper concern of the statesman and he will avoid them only if he knows, as Socrates did, that the only true knowledge lies in knowing that you know nothing. Indeed, the major risk is that Obama will try to govern by executive ukase. (He's done that a few times already, but the Republicans in the House have repeatedly said to themselves that a conviction is impossible given the balance of forces in the Senate.) Then we'll see whether the GOP has any spine left -- whether it's willing to impeach and try the Usurper once it has clear evidence of executive betrayals of the Constitution and a majority in the Senate. People keep reacting with revulsion to the idea of President Slow Joe. I don't see it. I don't think he has the smarts or the supposed charisma to have been able to do what Obama's done: he would never have gotten the soi-disant ACA passed, he wouldn't have been pushing a pointless bombing of Syria, etc., etc. For me it's easy to dispute your contention that "Romney would already be in Syria." He more likely would have supplied targeted military aid to the non-Islamic FSA, which is run by generals and other men with actual military training. He would most likely have offered support to the pro-democracy movement in Iran and moved to strengthen Jordan and Turkey. He would not have supported the Muslim Brotherhood in Egypt or deserted Mubarak in his hour of need. He would have put together a diplomatic initiative to support the military measures needed, and the British Parliament might well have voted to join him, rather than voting against "Obama's War". 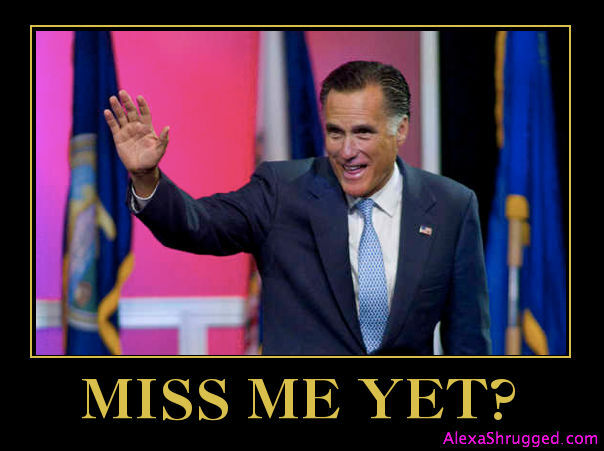 Muttophobe Mitt was for flip-flopping before he was against it. The fact is that we have an exclusive leadership class of spoiled, sheltered mediocrities, who would be nowhere without Daddy's Money. They also determine the rules for class-climbing, only inviting to the Country Club those no-talent wannabes who are willing to humiliate themselves, the ambitious imbeciles. To avoid self-destruction, we must abolish birth privileges. Romney would be at most a moderately successful owner of a Tough Love dog-training business. Obama would also be a nobody, because the whole Affirmative Action business is an attack on the majority from the bottom up by aristocrats who pretend to be Liberal. "Romney would already be in Syria, it seems impossible to say otherwise, and we would be six or eight months further along in that story arc, certainly with Boots on the Ground (as trainers or 'security' at a minimum) and with the local islamists and mafiosi purveying their bitter wares." Not sure about the timing, but Romney would not have thrown away Iraq, managed to make a deal for a base which would have helped stabilize the area. That would have changed things a lot -- either making the Iraq's neighbors behave better, or at least putting us in a far better position to act if needed (which makes the need to actually act reduced). Additionally, Romney would not have dithered while what moderates existed where were squeezed out/wiped out, like Obama did in both Libya and Syria. Congratulations on your first Instalaunch. I have to take issue with your parting comments. 2016 does NOT have to be too late. 60 seats by Republicans in the Senate in 2014 and a solid majority in the House would toss ObamaRx on the ash heap of history where he and his bankrupt ideas belong along with Marx, Engels, etc. If there is such a thing as evil in this world it is embodied in socialism and communism. America still has a wealth of natural resources. It still has the strongest industrial might and the most diverse population in the world. We can be a great nation again by celebrating rugged individualism, entrepreneurialism, minimally controlled capitalism, and Judeo-Christian ideals. We can't get there by supporting a dependency culture or by growing gubmint, but we are not dead yet. I have long said that the election was America's last chance at peaceful redress. When Obama was reelected (legitimately or not) I saw the worst come to pass and accepted that we faced tyranny, collapse, or civil war. But recently I've come to see one final chance. Mark Levin has shined a light on a path back with his Liberty Amendments. I still think tragedy is more likely, though. OK, Romney was not technically right about EVERYTHING. He was just right every time he disagreed with Obama. Beg to disagree. America didn't blow it. The Democrats and others who voted for Obama blew it. The Obama voters are not America. You don't have to impeach just defund. Of course that would mean having the spine to quit doing continuing resolutions and REFUSING to send anything other than finished budget's to the Senate. The GOP controls the purse they just need the stones to actually control it. It would be nice if we had an actual opposition party where the leadership would be interested in doing it's job: being the loyal opposition to the party in charge right now. It would require the GOP to grow both a spine and a pair... I'm convinced that it's not happening in my lifetime. I enthusiastically backed Governor Romney. I gave his campaign a fair bit of money and traveled to Ohio in the days before the election to go door to door on his behalf. He would have been an infinitely better President than the incumbent. But then, so would most people. Even so, I cannot accept Mr. Zwick's poisiton that Romney was the man for the moment. He may well have railed against Obamacare, but through Romneycare, he was its intellectual godfather - and that role bespeaks a flawed understanding of the limits of government. Further, I cannot agree with your comment that 2016 is a lifetime away and the damage inflicted by President Obama will be irrevocable by then. Adam Smith wrote (of England at the time of its defeat by its erstwhile American colonies) "There is a lot of ruin in a nation"; he was right - England recovered, and so will we. Incidentally, your self description as a social conservative gave me food for thought, resulting in this (http://civilhorizon.com/2013/09/08/social-conservatism-yes-and-no/) post on my blog. My guess is that in my personal values I am as or more socially conservative than anyone you know, but I don't think that such values can be effectively taught or enforced through the power of the government.